Be the first to share your favorite memory, photo or story of Inez. This memorial page is dedicated for family, friends and future generations to celebrate the life of their loved one. 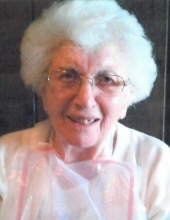 Beverly - Inez E. Biondini passed away peacefully on February 1, 2019. Born March 29, 1919, she was 99 years old. Inez was the middle of three daughters born to the late Eugenio and Caterina Biondini and preceded in death by her older sister, Laura Binodini and younger sister, Rose Nuccio. Although she never married, she is survived by her two nephews, Dr. Eugene J. Nuccio and his wife, Linda (Beaulieu) and Peter J. Nuccio and his wife, Terry (Rufo), three great nephews, two great nieces, three great-great nephews and six great-great nieces. Inez was a resident of Beverly for more than ninety five years and was well known for her involvement in and service to the Beverly and St. Mary’s Church communities. She was involved in the 4H organization during her youth, various Home Front organizations during World War II and the Daughters of Isabella and election day activities as an adult. Inez was also very active with the Senior Center, in particular, the weekly Wednesday night Beano fundraising/social activities for nearly two decades. An avid knitter and needle-pointer, she enjoyed traveling especially to Europe and the west coast of the United States. During her working career, she was the supervisor of the payroll data center for the Massachusetts State Transportation Department in Boston and received commendations and accolades for her high standards of accuracy and knowledge. Her funeral Mass will be celebrated at St. Mary Star of the Sea Church, 253 Cabot Street, Beverly, Wednesday, February 6, 2019 at 10:30 a.m. Relatives and friends are invited to attend. Visiting hours at the Campbell Funeral Home, 525 Cabot Street, Beverly, Tuesday from 4 to 7 p.m. Burial in St. Mary’s Cemetery, Beverly. Information, directions, condolences at www.campbellfuneral.com. To send flowers or a remembrance gift to the family of Inez Biondini, please visit our Tribute Store. "Email Address" would like to share the life celebration of Inez Biondini. Click on the "link" to go to share a favorite memory or leave a condolence message for the family.